The Russell Wilson question now takes a dramatic shift. The quarterback and the Seahawks agreed to a contract extension late Monday night/early Tuesday morning. The unseemly part is over – the endless debate about guaranteed money and percentage of the salary cap and how much Wilson really wanted to be in Seattle. They hashed all that out, as was always nearly inevitable despite the tumult, and announced a new deal while the sane world was fast asleep. Now it becomes about legacy, and what has the potential to be one as decorated and eternal as any in Seattle sports history. Wilson will be a Seahawk, virtually guaranteed, through the 2023 season. That gives him 12 seasons of his prime, through age 35, to burnish his credentials. And it gives him five more seasons – at least – to enhance what already is a resume for the ages. Then we’ll see what happens after that. It’s hard to know – and now we don’t have to ponder it except in a theoretical exercise – what a failure of negotiations would have done to all this. But it had the potential to get fairly ugly fairly quickly. It’s easy to envision a background of distrust and uncertainty prevailing while Wilson went year to year toward a departure via free agency after 2021. Or sooner, if the Seahawks had felt compelled to trade Wilson to ensure they got something for the quarterback before he departed. That might have been even more of a motivation after watching safety Earl Thomas, his relationship with management roiled by a contract impasse, leave without the Seahawks being able to swing any sort of deal. Thomas is an instructive comparison, in fact. A great Seattle legacy has been compromised in some way by all the ugly contract business, and the ill will it engendered. I firmly believe time will sooth those wounds, and Thomas eventually will be welcomed back into the Seahawks’ fold as a hero. But his chance for an unblemished legacy was marred. Now Wilson has that chance, a clean shot at an unsullied Seattle immortality. He already has led the Seahawks to their first, and so far only, championship. That alone should get him a lifetime pass into the inner sanctum of Seattle sports titans, even if the perception remains that the Seahawks’ defense was the real impetus for that Super Bowl title. The Seahawks’ Super Bowl loss the next year, via an ill-fated interception by virtue of an ill-advised play call, always will hang over Wilson. Two consecutive titles, which should have been the Seahawks’ destiny when they sat at second-and-goal from the 1-yard line, would have elevated him to demigod status. Instead, Wilson still has the lone ring, plus seven years of brilliant quarterbacking – despite a subpar offensive line most of those seasons. Running back Marshawn Lynch has moved on, as has much of the vaunted defense, and all of the Legion of Boom. Wilson remains, having won more games in his first seven seasons than any quarterback in NFL history and coming off arguably his best season. The Seahawks unequivocally have turned over their franchise to Wilson, who will be 30 when they open the season in September. This new contract just strengthens that distinction. And there are many who believe they should now turn Wilson loose, releasing him from the offensive shackles foisted on him by coach Pete Carroll and his run-oriented philosophy. The counterpoint is that this strategy led Wilson to his most efficient season (a 110.9 QB rating, and a 35-to-7 touchdowns-to-interception ratio) in 2018. It also led Seattle back to the playoffs after a one-year absence, where that steadfast run orientation burned them in a loss to the Cowboys. The onus will now be on Carroll and offensive coordinator Brian Schottenheimer to maximize Wilson’s skills. It will be even more so on Seahawks’ front office to build a team around Wilson that he can lead back to the promised land. Of course, the instant Wilson signed his four-year, $140 million extension, with its $65 million signing bonus and $107 million in guaranteed money, that task became exponentially more difficult. That is the calculus of the modern-day NFL. But however onerous the mega-contracts of elite quarterbacks become, they are preferable to the alternative. 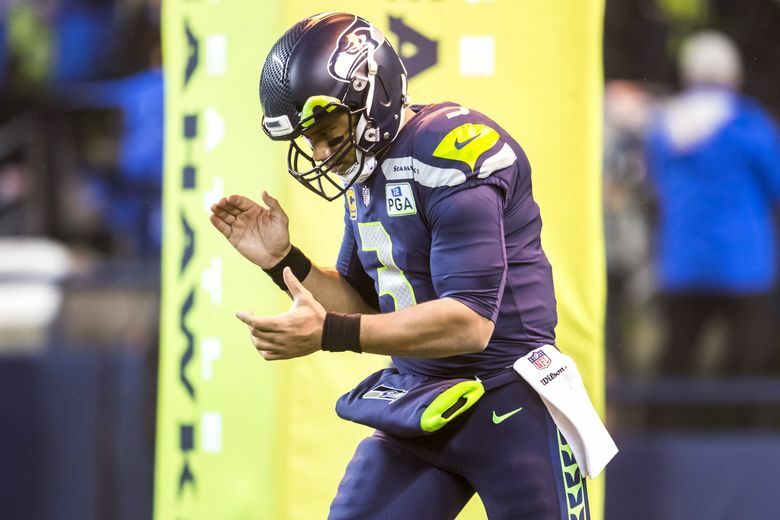 As easy as it was to advocate for the Seahawks to trade Wilson and build around a cheaper, young quarterback – as they once did, to magnificent effect, with Wilson himself – such a strategy is fraught with potential pitfalls. Just ask the innumerable teams in perpetual, and futile, search for their franchise quarterback. The more prudent route is still the one the Seahawks chose, which is to not let him get away once you find him. The Seahawks will have to be creative and bold in filling in the team around Wilson, and that will start with figuring out how to keep linebacker Bobby Wagner and defensive end Frank Clark in the fold. Beyond that, Wilson will have the time and space to augment his already special place in the Seattle sports stratosphere. There are bonus points that come with choosing to stay for the long haul, as Wilson essentially has done. Oh, Wilson could still leave when this contract runs its course, but that would be for the twilight years. The heart of his career will be played out right where it started. And at or about midnight on April 15, Russell Wilson left his heart in Seattle. Larry Stone: 206-464-3146 or lstone@seattletimes.com; on Twitter: @StoneLarry. Larry Stone calls upon more than 30 years as a sportswriter to offer insight, wisdom, opinion, analysis - and hopefully some humor - regarding the wide world of sports. Topics include the thrill of victory, the agony of defeat, and, especially, the people responsible for either outcome, as well as the wide chasm between.